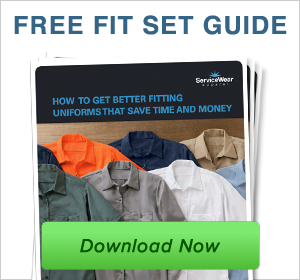 ServiceWear Apparel recommends fit sets to help government agencies save time and money and get properly fitting workwear for their employees. Fit sets are a range of sizes of the true workwear pants and shirts an agency uses. The agency purchases a fit set, allowing employees to actually try on the workwear garments they will be wearing. It is not necessary to ever replace a fit set unless the agency changes workwear styles. Fit sets also allow new hires to be in workwear much faster. The National IPA workwear contract provides agencies with the process for accomplishing this. How does a fit set improve order accuracy? There are two common methods used for garment sizing: measuring body dimensions or trying on garments using a fit set. To ensure an accurate and comfortable fit, fit sets are the preferred method. Since manufacturers use different patterns to make their garments, the fit will vary according to the pattern dimensions. For example, one manufacturer's pattern for a size medium shirt may be another manufacturer's pattern for a size small shirt. Trying on workwear garments before ordering is recommended, as it helps prevent exchanges or discomfort to the wearer. Fit sets mirror how people shop for their own personal garments. Rather than getting measured, we select garments off the rack and try them on in a fitting room. If they are too loose or tight we select a different size that fits more comfortably. 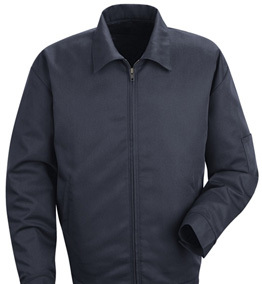 workwear garments should be selected with the same process to achieve the most comfortable fit. How does a fit set reduce expenses? By using a fit set your employees will not have to leave work, travel to and from a workwear store, wait in line, and then try garments on to place a workwear order. With fit sets, they can do it all right at the agency and employee labor expenses can be managed more effectively. This expense is usually not considered or budgeted by agencies. 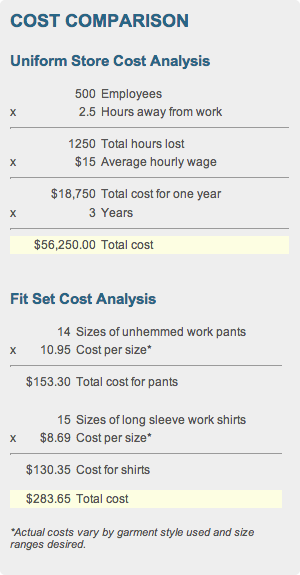 The diagram to the right compares the cost of sending 500 employees to a workwear store for three years to the cost of a fit set. The total estimated savings are $55,966.35.